Getting repeat gifts reduces acquisition costs and the reliance on large donors or foundation grants. With a tight economy, the impact of smaller donors who give multiple gifts can be felt on the bottom line and have a much great impact than trying to work for increasingly difficult to raise large grants and donations. Donors have always looked for authenticity and relationship from nonprofits. 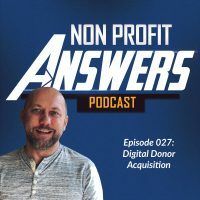 In the past, the lack of an efficient way to offer two-way communication limited the ability of donors and nonprofits to authentically connect. Today, there are so many ways for two-way communication that nonprofits have to be strategic with which ways offer the most impact. Naturally, social media provides an authentic way to communicate with donors. It allows donors to connect to one another and form community around a common cause. What is required for authentic engagement with your donors? Last month, I posted a question or comment every couple of days in social media on posts from an organization I support. I am genuinely interested in hearing from them, yet I never received a reply. The organization wasn’t inundated with comments, I was often the only one. Unfortunately, nobody at the organization was paying attention to comments received. After three weeks, I gave up and haven’t paid attention to their social media posts since. If you’re going to post in social media, you need to listen and respond to your audience. Social media is not a parade that goes by with you shouting at bystanders, but instead it’s an intimate party where you have a chance to mingle and talk with a variety of people. Social media devours content. It can be easy to get so focused on producing content that you forget the opportunity for conversation. Create content that sparks discussions. Create something unique and striking that will draw your readers or viewers into the post to interact with you. I don’t enjoy receiving email from organizations where the from email address is “donotreply@nonprofit.org” or there is a notice that says something to the effect, “Please do not reply to this email as this inbox is not monitored.” Why not? If someone does reply to your email, make sure someone is replying on the other end! If you’re not, you’re missing out on a unique opportunity to communicate with a live person who supports your organization. Have you ever been to a party and met someone who only wanted to talk about himself? I have one word to describe the experience: boring. Unfortunately, sometimes we get caught in the trap of only talking about ourselves. If we only have $30,000 we could finish this project. Another $50,000 will help 1,000 more beneficiaries and get us some new equipment! Win win! Did you know it’s fiscal year end? Give us money to close out the fiscal year strong! All of these messages are important to our organization, but are they meaningful to a donor? Instead, what information is she looking for? Would she want health tips that relate? A new recipe from one of your fields? A new tool to teach her kids how to be compassionate? A story of beneficiary whose life was transformed? There are so many opportunities to create interesting, engaging, and meaningful content for your audience. Instead of sending out another email appeal, what can you send that would be really interesting for your donor to experience? When you engage your donors in a meaningful way, she’s more likely to read and respond to your next fundraising appeal. Your donor is the reason you can do the good work you do. She is the hero for your organization. When you treat her as such, it builds loyalty as she understands the role she plays. When she looks to your organization as the tool she can use to make a big impact, she’ll appreciate the work you do and continue giving. Being the hero also requires understanding the successes and impact she’s made. Be sure to tell plenty of stories of how her donation is making an impact with the people you serve. Donors want to hear from you — especially if you’re not calling to ask for more money. In fact, when you call a donor just to say thank you, tell her a quick story, and ask about how she’s doing, it will help your organization build a deeper relationship with the donor. People want to feel valued – and you shouldn’t call just because it increases donations. You should call because you care about the donor as much as you care about the beneficiaries you serve. When you put the donor and her needs first, you win. And winning doesn’t just mean more money. It means you provide value to a donor’s life irrespective of the amount of money she gives you. When that is your motivation for communicating with donors, the rest will take care of itself. Donors like to be heard. Start with a post-donation survey. After you receive a donation online, ask the donor about the experience. Did she have any problems? How did she hear about your organization? What motivated her to give? What information would she like to receive in the future? Donor surveys provide valuable information for your nonprofit and help people feel a connection to your organization. Your donors appreciate feeling heard and a donor survey is a win/win proposition for both of you. A tool like SurveyMonkey is an easy way to get started. You can even create a simple post-donation survey to put on your thank you page and learn valuable information about your donors. Focus on building relationships with your donors and loyalty will follow.